Summer is the focus of many families across the country. Hiking excursions, trips to the beach, lounging by the pool, and many other activities are at the forefront of the minds of several people. 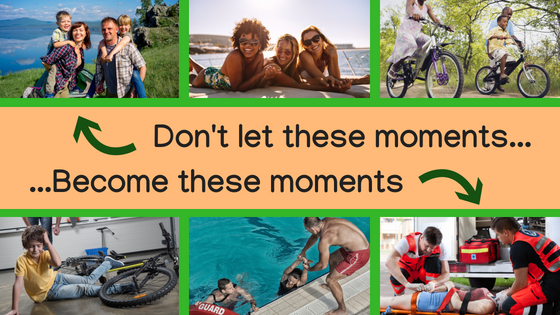 This is a great time of year for family togetherness; however, we must not forget to plan our activities in such a way that we can attempt to avoid family fun becoming a family emergency. This blog focuses on driving, heat, and water safety; however, I will share even more information on my social media pages. Please follow the pages listed below to stay up-to-date on all the tips and information shared. The majority of all trips this summer will begin with a drive in the family car. What people often fail to realize is that it doesn’t matter how far you have traveled, accidents can happen at any point in your trip. The more familiar you are with a road, the easier it can be for your mind to go on autopilot. When driving you should always be aware of your surroundings so you can avoid sudden obstacles in the road, especially children playing now that school is out for the summer. One hazard that should be avoided by drivers is using your phone while driving. Text messages, social media, and emails can all wait until you are stopped in a safe place. Did you know that people who drive while reading or writing a text messages are 23 times more likely to be involved in a car crash than others? Typically , distracted drivers who are involved in accidents were distracted a mere three seconds before the crash (http://www.donttextdrive.com/statistics/). A danger that can be just as bad as being on your phone while driving is driving when tired. If you start to get tired while driving, find a safe location to pullover, switch drivers, take a nap or stop for the night. Do not risk everyone’s safety by chancing falling asleep at the wheel. According to Shell’s Arrive Alive – Don’t Drive When Tired campaign, https://go.shell.com/2McxOap, in 20% of all road traffic fatalities, driver fatigue was a major factor (this is more than the statistics for drugs or alcohol). Also, I cannot stress enough the importance of EVERYONE in your vehicle wearing a seatbelt. According to the National Highway Traffic Safety Administration (NHTSA), in 2016, 57% of passenger vehicle occupants, ages 18-34, who were killed in automobile accidents were not wearing their seatbelts at the time of impact. For more data and other information about NHTSA’s #ClickItOrTicket Campaign, visit https://www.nhtsa.gov/campaign/click-it-or-ticket. As the video below shows, there is NO good excuse to not wear your seatbelt. While we are on the subject of driving and cars, let’s not forget to talk about hot car deaths. Never leave your children or pets unattended in a vehicle. Did you know that an average of 37 children in the United States will die in hot car deaths every year? According to www.kidsandcars.org, even cars with their windows cracked can reach a temperature of 125 degrees in just minutes. In fact, 80% of the temperature increase happens within the first ten minutes. Also, no matter what you are a doing outside this summer, you should pay attention to the signals of heat-related illnesses in yourself and others. Check out the graphic below created by the Center for Disease Control and Prevention on the symptoms of various heat-related illnesses and how you should react. Pets can also suffer from heat-related illnesses. Check out the Arkansas Veterinary Emergency & Specialists blog on “What You Need to Know About Heat Stroke” at https://bit.ly/2Hzukv4. A lot of families will choose to have fun in the water this summer. While having fun, be sure that you are keeping your family safe. If you are going out on a boat, kayak, canoe, etc., be sure that everyone is wearing a good fitting life jacket. If you are unsure about how pick a good life jacket, check out the U.S. Coast Guard’s manual on “How to Choose the Right Life Jacket,” at https://bit.ly/1Dvvu5x. According to the Safe Boating Campaign, 80% of boating deaths are due to drowning and 83% of victims were not wearing a life jacket (http://www.safeboatingcampaign.com). Safety is also important while swimming. You should always swim with at least one other person, no matter how good a swimmer you are, you can still need assistance in the water. Children should not to left unsupervised around bodies of water, even if they are wearing a U.S. Coast Guard approved life jackets. Check out the American Red Cross’ water safety webpage for more tips on staying safe near water, https://rdcrss.org/2ttejEl. Learn about some of the quiet signs of drowning by watching a newscast by WBAL-TV 11 Baltimore below. I hope everyone gets the chance to go out for some fun this summer! Enjoy yourselves and stay safe! Please remember to also follow Do It for Don on Facebook, Twitter, and Pinterest for more tips and information.